With the D-link High-Definition Media Player (DSM-510), you can sit in the comfort of your living room along with friends and family and enjoy media content available on a networked PC, NAS device, or USB flash drive on your big screen TV and sound system. The DSM-510 enables streaming of videos, music, and photos over a wireless G or wired Ethernet connection. Watch your videos with resolutions up to 1080i for superb quality from your HDTV. Enjoy brilliant High-Definition (HD) picture quality with the compact D-Link® MediaLounge™ High-Definition Media Player (DSM-510). With the DSM-510, you can sit in the comfort of your living room with friends and family and enjoy media content available on a networked PC or Network Attached Storage (NAS)1 on your big screen TV and sound system. 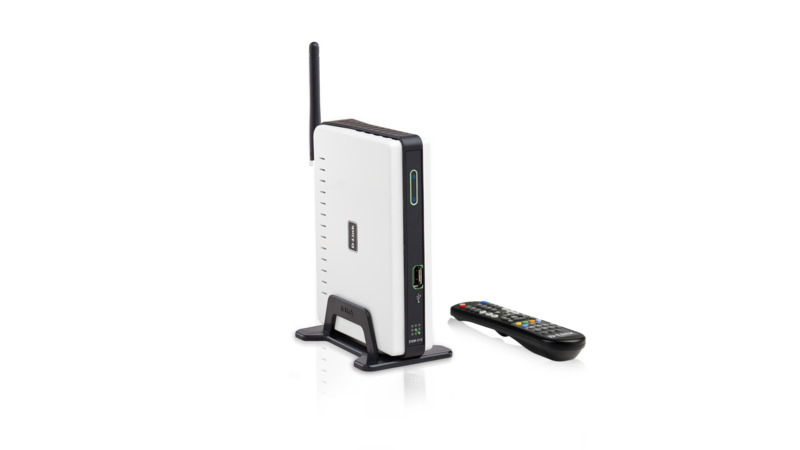 The DSM-510 enables streaming2 of videos, music, and photos over a wireless 802.11g or wired Ethernet connection (a wired network is recommended for optimal video streaming). In addition, the DSM-510 provides a USB 2.0 port in the front panel for instant access to media stored on removable USB flash drives3. The DSM-510 supports HD video in Windows Media® Video 9 (WMV9), MPEG-2, MPEG-44, DivX®5, and DVR-MS formats6. Enjoy videos with resolutions up to 1080i for superb picture quality from your HDTV using an HDMI connection, or connect to Standard-Definition Televisions (SDTV) using Composite Video cables. The DSM-510 is a DivX® Certified device5, providing a high quality video experience. It lets you easily take DivX video from your computer and play it back on your TV at DVD-quality5. DivX videos are a fraction of the size of DVD files making playback over a home network more reliable. Setting up the DSM-510 is simple and, with support for Windows® Connect Now, configuring the wireless settings are easier than ever before. Simply run the Wireless Network Setup Wizard from Windows Vista® or Windows® XP Service Pack 2 and transfer the wireless settings to the DSM-510 using a USB flash drive3. Experience digital media like never before in your living room with the D-Link MediaLounge High-Definition Media Player (DSM-510). 1 Certain features of this device may be unavailable when accessing stored media content on network attached storage devices. 2 Use a wired connection for improved performance with video and other media. Additional hardware devices, software, or services may be required for Internet connection to access online media. 3 USB flash drives not included. D-Link is not responsible for damage to USB flash drive, or loss and/or damage to files on the flash drive, due to improper installation or usage. 4 Supports MPEG-4 Advanced Simple Profile only (without quarter pixel or global motion compensation).4 DivX codec is available with Firmware version 1.06 or later. 5 DivX codec is available with Firmware version 1.06 or later. 6 Ability to play certain digital content over your home network may be limited by Digital Rights Management (DRM) content protection mechanisms and authorization from the content owner or service provider. See www.dlink.com/dsm510 for supported DRM solutions.